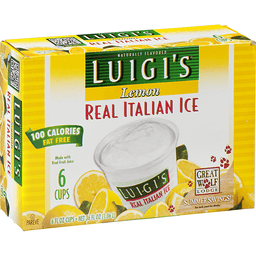 Luigi's® Real Italian Ice Lemon. Naturally flavored. 100 Calories. Fat free. Gluten free. Peanut free. No HFCs. Made with real fruit juice. 6 fl oz cups. Net 36 fl oz (1.06 L). Caton made from 100% recycled paperboard; Minimum 35% post consumer content. For consumer information Call 800-486-9533. www.luigis.com.